Corn is in and with the hot weather, there’s no better way to cook corn than to grill it. People have asked me what’s the best way to do it? There are two basic ways, depending on what you’re after. Corn today is so sweet and tender, it only needs to be heated through, so your decision is really one about types of heat to use, high direct heat, which will brown the corn giving it a grilled flavor, or low temperature, steamed within its wet husk. I like both and the above corn which we ate after a day at the beach (sigh), used a little of both. I love the appearance because it tells you how it was cooked. If I want a really smoke roasted caramelized flavor, I’d shuck the corn and put directly on the grill over hot coals. If I want the smokey steamy effect, which gives you a cleaner corn flavor, pull the husk back, remove as much silk as possible, fold the husk back up and soak the corn in cold water 15 or 20 minutes. Then grill over direct heat until heated through, five or ten minutes, depending how hot your flame is. I love grilled corn either way. But don’t always think of it to go with burgers. Grilled corn makes a great dessert. You can make it the easy way below. Or you can go all out by making your own ice cream, substituting half the dairy with fresh corn juice (here’s an all-purpose recipe for vanilla ice cream/creme anglaise; use 8 ounces corn juice and 8 ounces milk). Garnish the ice cream with grilled corn, some zest from the lime and a couple of drops of juice. Or: Let ice cream soften slightly, stir in grilled corn, re-chill, serve with lime zest and a sprinkling of kernels. Or: make your own ice vanilla-corn ice cream, stirring in grilled corn before transferring it to the freezer. My post on chipotle corn ciabatta. Aki and Alex of Ideas in Food share their fresh corn polenta recipe. Mexican corn on the cob recipe from the Homesick Texan. Pastry chef Michael Laiskonis has an interesting recipe for corn sorbet. Donna, that picture! Oh my, MY! Great corn post, but I have a question. Why is it that you take the corn silk out and soak it? I have always just bought whole corn and thrown it directly on the grill until the silk at the end is burned off and the outer leaves are kind of brownish and dried up. Should I be soaking it and removing the silk too? As you know, your way works fine too, but I like to remove the silk before cooking to make it more pleasant to eat. And no you don’t have to soak it; soaking keeps the heat down. Thanks, I will definitely try it out, I think I was just being lazy more than anything, ha. I personally don’t have a problem eating corn raw. In fact, anything more than merely raising the temperature of really good corn is a sin. What most people know as corn though seems to be the starchy, stale grocery store bought stuff. To really get the best of corn, it needs to be consumed within a few hours of picking. The sooner the better. My apologies. I could rant on about corn for pages. That picture is mouth watering fantastic! A while back someone I work with brought in a few large boxes of corn and we would put them right in the microwave for 3min per ear, let them steam in the husk for a min then peal and eat. So easy and holds all the flavor, I’ve never seen anyone else do this (probably for some health reason unknown to me) but it tasted great. I love to grill them and put mayo, ancho or chipotle powder, feta or cotija cheese and a little fresh squeezed lime juice. I’m a bit of a barbarian when it comes to grilling things. I don’t really do much to the corn other than chucking into a bucket of cold water for 45 minutes or an hour before grilling. Then, when it comes time to grill, I just toss the ears directly onto the coals and turn a few times over the next several minutes. After that, I throw them into an old cooler, slap the lid on, and let those little corny things contemplate their fate in a nice steam while I put the grate back on my grill and cook some of the corns’ meatier sidekicks. When it comes time to eat, it’s just butter and salt. Lots of butter. If the dog is not dancing around beneath my dripping elbow, there isn’t enough butter on the corn. With the husks peeled back a bit (Ruhlman’s method above) I like to soak the corn in a cold brine of salt and a little sugar for a few hours. 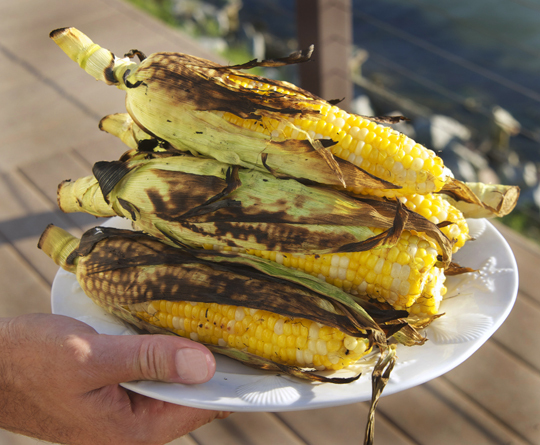 Adds loads of moisture and a light salty flavor on the husks and corn as they grill. Like any brine it can be doctored up with your favorite herbs, garlic, lemon/lime juice, or sub some of the water for veggie or chicken stock. Where is the veal salt? gws Cali, “get well soon” so you can enjoy the summer corn next year. BG: I soak ears of corn in water for at least 20 minutes, no removing of silk, peeling, etc. Just dump ’em in the sink and let soak while I start prepping my other grillables. Then onto the grill! I have found that shucking after you pull them off the grill is fairly easy, and, if you’re burning your fingers while trying to get the stray silk strands off, just use a soft veggie brush. One of my favorite food memories as a kid is the corn roasts my grandparents used to have. All of us cousins pulled the silk (a rewarding, yet irritating chore) and the corn went into big galvanized trash cans to soak. The grills were 50 gallon drums cut in half and set up under the big willow tree right next to the tire swing so the men could work in the shade as they cooked. The women were in the house making potato salad and talking smack about the men…oh those were the days. Thanks for the trip down memory lane! Fresh corn is so good on the grill. The only addition to Ruhlman’s method above is that I like to soak the corn in a brine of salt and a little sugar for an hour or more. The brine adds a salty moisture to the husks and corn as it cooks on the grill. As with all brines you can doctor them up with herbs, garlic, lemon/lime juice, and even sub out some of the water for veggie or chicken stock. The brine really makes a tasty difference for corn and other vegetables. This is very possibly the MOST disgusting recipe I have ever read on the internet. Man, you REALLY need to get a day job. The recipe sounds interesting. Sweetness of the corn, the chill and texture of the ice cream, and the slight bite of the lime? Intriguing. Thanks for offering this diversion, and I agree…. there’s something about this photo. The corn jumps off the page! Good job! I personally prefer to steam corn myself. it comes out softer and juicier. Your vanilla ice cream with grilled corn is a unique idea. I’m gonna give this recipe a try. Grilled corn on the cob is very good. Deep-fried is even better. No batter, just shucked & silk removed. Favorite seasonings: butter, chile powder, and lime juice. Grilled corn on ice cream..sounds good, I’m giving it a try! Thanks for the tip in how to grill corn, it’s been a long while since I’ve had it, I usually just steam it or buy it already steamed 🙂 Have a nice day! I love grilled corn…but never would’ve thought to put it on ice cream. Definitely sounds interesting…might have to give it a try!